A diving group in Bulgaria have created a unique art exhibition under the sea, providing a perfect place for any divers who are in the area to view some artwork while they are exploring the depths. The gallery has been set up to celebrate Bulgarian independence day on September 22nd and includes two copies of famous works of art by Leonardo da Vinci. 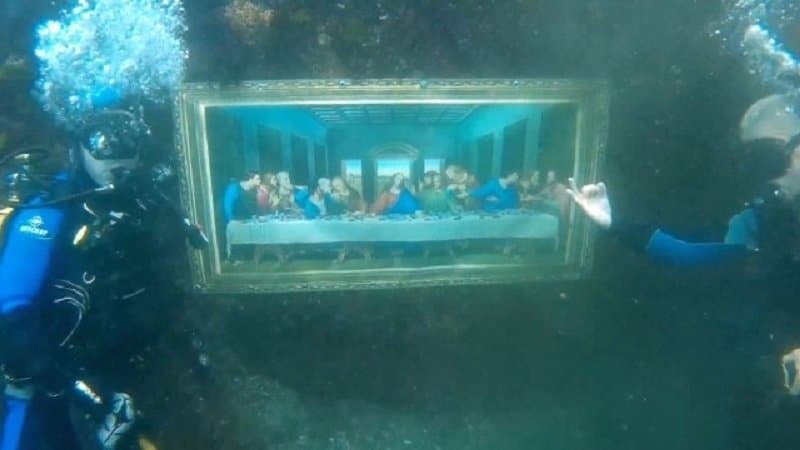 The first is a copy of The Last Supper while the second is a reproduction of the Mona Lisa. Both pieces have been specially designed so that they won’t be damaged by the seawater and sit 26 feet below the surface on a reef. The Poseidon group plan to take more paintings to the seabed in the coming months. The area has already become somewhat famous for some of its underwater attractions. Another group set up a chapel in the sea in dedication to Saint Nicholas. The structure for the patron saint of sailors has become popular amongst divers and some have even held mass in the building and celebrated Easter there.